Grand Lodge of New Zealand. The 2004 Kellerman Lecture for New Zealand, published in ANZMRC Proceedings 2004. For a variety of reasons this is a question that has largely been left unanswered—and, I rather suspect, unasked. The main reason for this is simply that there has been a knowledge gap between Masonic authors, who have the enthusiasm and experience in matters Masonic, and academic professionals, who have a significant exposure to a largely specialist body of knowledge and learning which may be able to shed light on a variety of different aspects of Masonic life. With the shift in focus at universities towards Post-modernism and interdisciplinary studies, and the shift within the Craft itself towards a more open and transparent form of Masonry, I feel that potentially we are entering a new phase in the way thinking Masons look at the Craft. Certainly the establishment of Chairs in Masonic Studies at a number of European and British universities bespeaks of a growing academic awareness of the cultural importance Freemasonry has had in Western society since the Enlightenment. As academia has begun to look at Freemasonry, perhaps we can seek to learn from academia. Ritual reveal values at their deepest level . . . men express in ritual what moves them most, and since the form of expression is conventionalised and obligatory, it is the values of the group that are revealed. I see in the study of rituals the key to an understanding of the essential constitution of human societies. The ceremonial forms of Freemasonry are possibly the most distinctive aspect of the Craft. While fraternity, benevolence and morality are all concerns of Freemasonry, they are also concerns of many other societies and groups. It is our ritual that sets us apart from other organisations—and perhaps it even defines us as Freemasons. Freemasonry is a society of men and, like any society, over the centuries it has developed a complex set of interactions and relationships within itself and with the ‘outside world’. Anthropology looks at the way societies interpret and relate to themselves and ‘the other’. What psychology is to the individual, anthropology is to a society or a culture. Anthropology as a discipline stared to coalesce towards the end of the 19th century, coincidental with the great days of Empire, and in part fuelled by the curiosity some of the Colonial administrators had for their Imperial wards, and their quest for a ‘scientific’ understanding of the difference between ‘them’ and ‘us’. As the study of other cultures became systematised, areas of specialisation developed—linguistic anthropology, medical anthropology, social anthropology, cultural anthropology, and others—and each developed with specialised concerns, approaches and methodologies. As with all things, over the years, ideas and theories come into, and then go out of, vogue and remind us of the old adage that the difference between a radical and a conservative is 20 years. The first great school of anthropological thought was the Functionalists, who viewed all social dynamics as primarily politically—or economically—based concerns centred on the long-term survival of the social or individual unit (depending on the type of Functionalism followed). Developing later were the Structuralists, the other great school of anthropological thought. The Structuralists were strongly influenced by linguistics and semiotics (the study of the meanings of words and symbols ), and took a particular interest in two main themes: the emphasis on meaning and symbolism (especially the subconscious aspects of meaning) and the emphasis on systems of exchange. Historically, the Structuralists have done much work with myth and kinship patterns. It is out of the Structuralist school of Social Anthropology that the most fruitful ideas and theories have arisen for consideration in the context of Masonic ritual. Traditionally, sacred drama—ritual—has been seen as a function of social control and integration, or a complex (and largely inefficient) method of tuition in techniques of survival in a given environment. Starting in the late 1960s, however, sacred drama began to be seen as something else, something more complex, and Victor Turner’s work on the Ndembu tribe of Africa (1967) is possibly the seminal work on the subject and gave shape to the developing field of ‘Ritual Studies’. In Turner’s work is found the beginnings of an approach which sees ritual as a deeply symbolic expression of a given set of core values that are not tied directly to a mechanical interpretation of society, such as reinforcing power–and–control relationships. Values, beliefs and ideals expressed in ritual are seen as attempts at understanding man’s place in the cosmos and his relationship with the Great Unknown, and ritual itself as a vehicle for social change rather than control. While it was not until the 1980s that ‘Ritual Studies’ became largely accepted as an academic sub-discipline, its origins can be found in the work of anthropologists and folklorists of the late 19th century, such as Sir James Frazer. However, one of the first and most influential books wholly dedicated to the examination of ritual was the ground-breaking Rites of Passage. In it, Arnold van Gennep wrote that human societies have a universal impulse to recognise and mark certain important transitions in a person’s life: events such as birth, death, coming-of-age, marriage and parentage. Van Gennep observed that ‘[F]or every one of these events there are ceremonies whose essential purpose is to enable the individual to pass from one defined position to another which is equally defined.’ Rites of Passage attempted to examine systematically the form and function of ritual, and look at these ‘defined positions’, not just describing the ceremonial events but also trying to answer ‘why’ and ‘how’. In his chapter on initiation rites, van Gennep immediately identifies the two most prominent forms of initiations: the reception into an age-grouping, and the reception into a ‘secret society’. It is soon evident, however, that by ‘initiation rites’ van Gennep has in mind primarily rites associated with age groups/coming of age ceremonies. His reason for concentrating on coming of age rites at the expense of secret societies could be two-fold. The first is the decided preference of the time at which van Gennep wrote (c.1906) for anthropological consideration to be devoted to what he rather quaintly called ‘primitive’, ‘simple’ or ‘semi-civilised’ societies—societies which were held to be in a more primitive state of existence than Europe and white America at that time. The second reason is that secret societies, by their very definition, are secret. Lack of detailed information hampered, and still hampers, research in this area. While we, as Freemasons, tend to resist the statement that Freemasonry is a secret society, and prefer the slightly more ambiguous avowal that ‘we are a society with secrets’, as far as van Gennep and his ilk are concerned, we are still effectively a secret society. Masonic researchers—who have an uneven reputation for scholarship—have not contributed much to the formal study of ritual. Most of the better-known and academically sound Masonic scholars have concentrated on the historical aspects of Freemasonry and ritual, rather than examining the meaning of the ritual itself. Even (reputable) authors with a sympathy for the esoteric aspects of Freemasonry, such as Robert Gilbert, are loathe to disassemble the ritual in any detail. The authors who have chosen to write in detail about the nature of Masonic ritual take, at best, a highly symbolic or abstract approach, such as: ‘the Winding Stairs consists of 3, 5, and 7 steps, numbers which among the ancients were deemed of a mystical significance . . . [similarly] words were supposed to have certain occult significances according to the sums or multiples of the numeric equivalent of its letters’. At worst, they leap head first into the abyss of downright stupidity, as did Charles Leadbeater: ‘[I]t is by the use of those perfectly natural but supernormal facilities [clairvoyance] that much of the information given in this book has been obtained . . . I am absolutely certain of [the] reliability of this method of investigation’. Part of the reason why there has been no authoritative or, indeed, reliable discussion on the construction and mechanism of Masonic ritual is that serious amateur study of this subject has been associated with the excesses of the esoteric school of Masonic research (of which Leadbeater is an extreme example) and as a consequence this avenue of research has been discouraged in the Masonic research fraternities (and by the editors of the world’s leading Masonic journal, Ars Quator Coronatorum) since the 1930s. Other Masonic journals have, on the whole, followed this lead, to the detriment of the possibility of the development of innovative discussion on Masonic ritual matters. A second reason for the neglect of Masonic ritual studies is that academics largely have not been in a position to make a serious study of the subject, not being Freemasons themselves and thus lacking the personal experience needed to make sense of what is primarily an experiential phenomenon. As an example, English anthropologist J S La Fontaine attempted an analysis of one of the initiation rituals of Freemasonry in her book Initiation. Unfortunately, this attempt is far from satisfactory, not only because of its brevity (it serves the purpose of quickly illustrating Arnold van Gennep’s three phases of a rite of passage—more about that later) but also because she is basing her interpretation on a written account of an extremely unusual Masonic initiation that involves the candidate plunging through a large paper hoop, and thus far removed from normal and modern Masonic practice. Additionally, the academics who are members of the Craft tend to feel the constraints of the Masonic obligations of secrecy, which have an obvious curtailing effect on their work. Today, however, this last constraint is somewhat less binding than it has been in the past, since, in an effort to become more open (and thereby attract new members), the Grand Lodge of New Zealand, in line with a trend among other Grand bodies, has defined the secrets of Freemasonry as ‘the methods of recognition’, the words, signs and grips which indicate Masonic affiliation and rank. This means that much more of the Masonic spectrum has been opened up for study and discussion outside the sometimes cloistered confines of Masonic research bodies. The intention of this paper is to introduce a number of people, ideas and concepts that I, as both a Freemason and a student of Anthropology, have found cross-fertilises both areas of study. Needless to say, this is not a comprehensive survey of ideas; on the contrary, it is really little more than dropping a couple of important and influential names in the hope that interested parties will follow up and look into these ideas themselves. While Freemasonry is not a religion, and goes out of its way to assert this, it does share many of the characteristics of religion, particularly the primacy of symbols and its reliance on ritual to inculcate ineffable spiritual or philosophic ‘truths’ to the participant. For this reason it is not unreasonable to equate Freemasonry with religion, or even magic, for the purpose of the discussion of the theory of ritual. Happy is he among men upon earth who has seen these mysteries. Freemasonry, as will be discussed in this paper, consists of the three Craft degrees, starting with the Initiation and culminating with the drama of the murder of Hiram and the ‘resurrection’ of the candidate into the community of the lodge. The symbolic death and resurrection of an initiand is not a uniquely Masonic motif. Not only is it a familiar theme in non-European cultures, it also is of ancient standing in European philosophic/religious systems. The concept of an initiate taking part in ritual whose prime motif is their own allegorical death and resurrection into a new life inside the community of the initiators was a common feature of ancient Grecian sacred life. The Eleusinian Mysteries in many ways set the standard for formal initiatory ritual in the European world, with its emphasis on secrecy, darkness, the death and resurrection of the initiand, the primacy of the community of initiates over non-initiates, a communicated ‘great secret’ and the communication of the ineffable through symbols and association. After the collapse of the Roman Empire it is impossible to follow the thread of the classical Mystery initiatory schema through the Dark Ages and the medieval period, and it is more than likely that the ‘apostolic succession’ of this schema was broken. It was not until the emergence of renaissance neo-Classicism in the 16th and 17th centuries that such a schema re-entered European thought and provided the foundation for the Masonic ritual of death and ‘resurrection’ found in the Hiramic legend of the Master Mason degree. Ritual, Catherine Bell argues, provides a window for the examination of cultural dynamics by which people make and remake their worlds. This window, however, is not one exclusively owned by anthropologists, sociologists, and historians of religion, but also by psychologists, philosophers and historians of ideas—anyone who wishes to examine the ticking structure of human society. There is, however, the widest possible disagreement as to how the word ritual should be understood, but, for the sake of simplicity, quibbling about what is and is not ritual will be put aside and assumed that ritual is meant in the formal, Masonic, sense so well known to us. The notion of ritual as worthy of a distinct line of intellectual enquiry first arose in the latter half of the 19th century, seeking to identify and explain what was believed to be a universal category of human experience. Theorists such as J G Frazer and E B Tylor held that non-European, and therefore ‘non-scientific’, societies explained their world by using a magico-religious model, a model that evolved into science and ‘differed from science primarily in being wrong’. Frazer repeatedly identifies ritual as fulfilling an inherently magical function, particularly death and resurrection rituals, which he explicitly associates with totemism. Ritual, religious beliefs and symbols are, in Turner’s perspective, essentially related. Ritual is ‘complex sequence of symbolic acts’, usually with religious or spiritual references. Rituals are storehouses of meaningful symbols by which information is revealed and regarded as authoritative and as dealing with the crucial values of the community. Not only do symbols reveal crucial social and religious values, they are also transformative for human attitudes and behaviour. Arnold van Gennep (1873–1957) was one of the first theorists to examine ritual in its own right, publishing Rites de Passage, his most influential work, in 1906. Van Gennep’s lasting contribution to the field of ritual theory lies in the attention he paid to a particular type of ritual, a ritual whose essential purpose is to mark the transition of an individual from one defined state to another, the rite de passage. Rites of passage do not adopt only one general form, but can be found in ceremonies of marriage, childbirth, hunting, coming of age and many others, and in all cultures. In essence, the rite of passage effects the transition from social invisibility to that of social visibility. Van Gennep describes how all rites of passage from one state to another are marked by three phases: separation, transition and reintegration, or pre-liminal, liminal and post-liminal. The pre-liminal phase comprises behaviour that symbolically detaches the individual from the group, removing prior social status and/or cultural conditioning. In the second state, the transition or liminal state (limen meaning threshold in Latin), the subject is caught between his former identity and his future one. As Turner eloquently puts it, ‘the attributes of liminal persona are necessarily ambiguous, since this condition and these persons elude or slip through the network of classifications. Liminar entities are neither here nor there; they are betwixt and between the positions assigned by law, custom, convention and ceremonial’. The final, post-liminal, phase is that of incorporation or reintegration: the passage is consummated and the subject is accepted into his (or her) new state. The status of the subject is once more (relatively) stable and his rights and obligations with the social group are clearly defined. The rite of incorporation brings with it an identification of a commonality, a bond that implies a responsibility. The recitation of a formal greeting like the Moslem salaam also has the effect of creating a temporary bond, which is why, according to van Gennep, Moslems look to avoid giving a salaam to a Christian. Within any given rite of passage these three phases may not be developed to the same extent; rites of incorporation are given prominence at marriages, while transition rites are more evident during betrothals. Thus, while a complete rite of passage may include all three states, in specific rituals these three types may not be of equal importance or significance. Victor Turner (1920–1983) carries on the work of van Gennep, affirming the importance of van Gennep’s tripartite division of the rites of passage into pre-liminal, liminal and post-liminal stages, but adds that ‘the whole ritual process constitutes a threshold between secular living and sacred living’. Turner, however, centralises the importance of liminality in ritual and from that develops what he calls comitatus or communitas. He distinguishes three (often interwoven) components of the liminal phase of rituals. a. sacred articles (‘what is shown’)—the Working Tools, Tracing Boards, grips, words, etc. b. performance (‘what is done’)—the enactment of the murder of Hiram Abif. c. instructions (‘what is said’)—the Traditional History, the Charge after Raising, Final Charge, etc. The symbols themselves represent the unity, continuity and integrity (in the sense of a sound wholeness) of the community; often they are simple in form but, because of their symbolic importance, they are often given complex interpretations. (2) The reinterpretation/reconstruction/recombination of familiar and commonplace elements of ‘cultural configurations’ (what we see/experience in our everyday world). Freemasonry has taken the tools used by operative masons for the construction of stone buildings and attached specific moral lessons to them, for instance. According to Turner, these representations force the ritual participants to think about their society and provoke the ritual subjects to reflect on the basic values of their social and cosmological order. (3) The simplification of the social structure. The only important social structure in liminality is the relationship between the initiand and the initiators, and the authority of the ritual instructors over the ritual community. All other distinctions between the participants disappear in favour of equality. It is from this notion of equality within the community that Turner derived communitas. Turner states that there are two models for human interrelationship. The first is of society as a structured, hierarchical system of political, economic and legal privileges, separating men in terms of ‘more’ and ‘less’. The second, one that achieves a degree of prominence in the liminal period, is a relatively unstructured and relatively undifferentiated community or communion of individuals, who submit together to the general authority of the ritual elders. Turner goes on to make the point that the distinction of structure and communitas, or structure and anti-structure, is not a simple division between the sacred and secular worlds, but rather ‘sacredness’ is acquired by the temporary participation in the rite of passage, in which positions in the ‘outer’ world may be changed in the inner world of the ritual. It is not a matter of the rite of passage legitimising society’s structures, but rather ‘it is a matter of giving recognition to an essential and generic human bond, without which there could be no society. Liminality implies that the high could not be high unless the low existed, and he who is high must experience what it is like to be low’. Communitas naturally subverts structure by not recognising prior social divisions and it prioritises personal relationships. For Turner, the uniting feature of such diverse groups as court jesters, millenarian movements, ‘dharma bums’, monastic orders, tiny nations, wandering monks, and Masonic lodges are that they are people or principles who are operating, temporarily or permanently, outside the network of relationships and structures of normal society—the structures of ‘rich’ and ‘poor’, ‘black’ and ‘white’, ‘fat’ and ‘thin’, is of limited relevance within the anti-structure of communitas. Communitas and anti-structure operate in bubbles within society—a commune, a monastery, a lodge—areas that cannot be freely entered or exited without disrupting the communitas so traversed. Turner characterises structure to be ‘pragmatic and this worldly’, as opposed to communitas which is more ‘speculative and generates imagery and philosophic ideals’. The border between structure and anti-structure is rich in symbols, and the ‘passport’ that allows the crossing of that border is often a familiarity with those symbols (fig. 1). Anti-structure generates imagery and symbolism as a natural consequence of its very existence. A commune of hippies has opted to ‘drop out’ of a world controlled by ‘multinational fascists’ or ‘capitalist pigs’, who are ‘square’ and ‘up tight’, in order to return to ‘Mother Nature’; Rastafarians wait for the return of the ‘King of Kings’, the ‘Lion of Zion’, while living in their ‘Babylonian captivity’ at the mercy of ‘baldies’ (bureaucrats); the lodge separates the ‘Widow’s Son’ from the ‘Cowan’, and talks about ‘acting on the level’ and ‘being square’ with the brethren. The very notion of ‘that which is holy’ is based on the reversal, or at least the subversion, of institutionalised relationships, accompanied by ‘experiences of unprecedented potency’—experiences, Turner suggests, of the ‘levelling and stripping’ of external status from the inner world. 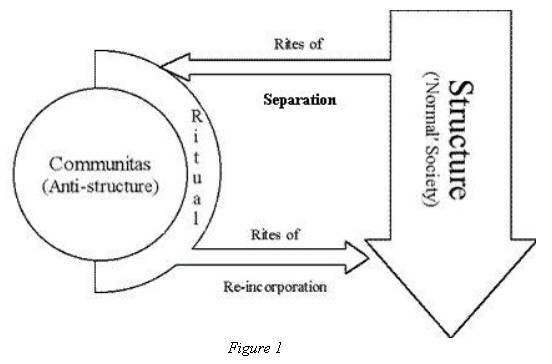 Rituals facilitate the crossing of the threshold between structure and anti‑structure in that they mark a detachment of the individual from structure (society) in preparation for re-integration into the anti-structure (in our case, the Lodge). Such rituals are of varying complexity and length, from the days, months or years of tribal cultures, to the hours for a Masonic initiation, or simply the time it takes to share a vegetarian meal or roll a joint among the more relaxed communitas. Turner’s later writings focus greatly on the relationship between ritual and theatre as expressions of performance. Performances, either ritual or theatrical, reflect both the individuals that take part in it and the society in which the performance is shrouded. The narratives—dramatic, ritual, or otherwise—engage the interest of observer and participant via their own life experiences, whether they are consciously or unconsciously aware of it. For Turner, religious expression, of which ritual is a significant manifestation, is like art in that it ‘lives in so far as it is performed . . . religion is not a set of dogmas, alone, it is meaningful experience and experienced meanings’. The role of ritual, in its deepest sense, is to communicate. By a process of repetition, the ritual imparts and reinforces what Theodore Schwartz calls an idioverse—the way in which we look at the world around us. The important point is that the idioverse gives us a model of our environment but is not the actual or ‘real’ environment. An analogy is the difference between a map and the actual countryside the map represents. All rituals, according to Turner, have this model-displaying character, and in a sense they ‘create’ society as much as they are created by it, since ritual, like works of art, provides a model for the classification and reclassification of ‘reality’ and man’s relationship to society, nature and culture. In ritual the world as lived and the world as imagined…turns out to be the same world. The three Craft degrees of Freemasonry—Entered Apprentice, Fellow Craft and Master Mason—when examined as a single initiatory system clearly show van Gennep’s three phases of a rite of passage. In the Entered Apprentice degree, the most dramatic portions of the ritual focus on the rites of separation. The initiand is made to wait in the refectory outside the lodge, with the Outer Guard or Tyler in attendance. He then has his clothing rearranged so as to expose a heel, a knee and part of the chest, and is blindfolded before being led into the lodge to undergo his ceremony of initiation. This peculiar rearrangement of everyday clothes serves to reinforce the idea that the initiand is separating from the normal codes and conventions of the everyday world and is preparing to enter a separate world, in effect a separate reality. The Fellow Craft degree is very much a transition phase, both in terms of van Gennep’s model and also in popular Masonic interpretation. Unlike the privileged position which rites of transition have in van Gennep’s, and especially in Turner’s, works, most Masons view the Fellow Craft as a bridge between the two ‘important’ degrees of Entered Apprentice and Master Mason, lacking in any importance in its own right. Masonically, the Fellow Craft degree affirms an initiand’s membership within Freemasonry, but reminds him that he has a form of probationary membership and no significant authority within Freemasonry. The particular moral lesson of this degree is to ‘study the liberal arts, which tends so effectually to polish and adorn the mind’. The emphasis on education affirms the transitional nature of the degree; education takes time and in our society attendance at educational institutions is the particular province of those undergoing transition into adulthood. The final degree, Master Mason, forms the climax of the three degrees, both structurally and dramatically, and reintegrates the initiand into the community of the lodge. It is in this degree that full membership within Freemasonry is conferred: the ability to propose or second new members; to hold a ritual office within the lodge; to become a member of Grand Lodge; and a variety of other rights and privileges. However, a better illustration of van Gennep’s three phases can be made if we alter our frame of reference away from looking at all three degrees at once and concentrate on a single degree, that of the Master Mason. The raising of a Master Mason starts with a rite of re-incorporation into the Masonic body. A lodge is opened as an Entered Apprentice lodge, the Masonic credentials of attendees (including the initiand) are checked and general principles of Freemasonry are reaffirmed. The point to stress is that an emphatic distinction is made between the Masonic and ‘Profane’ worlds, and the Mason and the Cowan. A border is drawn, and only the initiated may cross it. The lodge is then opened in the second degree as a pre-liminary phase to the third; each degree has the ‘furniture’ (symbols) of the lodge arranged, concealed or revealed in a particular manner according to the degree. In the Fellow Craft lodge the initiand is then asked the test questions of the degree and, after giving satisfactory answers, is presented with ‘a pass grip and pass word leading to the degree to which you seek to be admitted’, and is taken outside the lodge to prepare himself for the ceremony of being raised to the degree of Master Mason. As the initiand prepares himself outside the lodge, the lodge opens itself as a Master Masons lodge and prepares itself for the ceremony. When both the initiand and the lodge are ready, the Tyler, whose job it is to ensure the security of the lodge room during the ceremonial and to prepare the initiand for initiation, knocks on the door. The Worshipful Master of the lodge directs (through the Junior Warden) an inquiry to be made by the Inner Guard as to who seeks admission, and to receive the pass grip and pass word of the initiand as he stand outside the lodge. The Inner Guard affirms that the pass grip and pass word of the initiand are in order and the Worshipful Master then orders the initiand to be admitted into the lodge. Such a pattern van Gennep explicitly associates with the pre-liminal phase of the rites of passage if we have as our frame of reference only the ceremony of the initiation of a Master Mason—the initiand has been separated from the body of the lodge and must apply to re-enter it. However, if we change our frame of reference back to the examination of the rituals of all three degrees as a single body, then the initiand can be seen to be in a phase of liminality or transition, since he has been excluded only from a Master Masons’ lodge, but they are still functioning within the Masonic sphere. Such a person is privileged above other Fellow Crafts in that he has a pass grip and a pass word and is neither wholly a Fellow Craft (since the imparting of the pass grip and pass word is part of the Master Mason initiation ceremony), nor is he a Master Mason, since he has not gone through the actual ceremony. Van Gennep identified a formal, even ritualistic, protocol among the tribes he studied when admitting strangers into the village—a pattern that is reflected both in the welcoming of visitors onto a Maori marae and the initiand back into the lodge. The arrival of a stranger reinforces the cohesion of the group. An alarm is given by the scout. Runners are used to indicate when the visitors approach the marae. The tyler gives ‘the alarm’ by rapping on the door of the lodge. The chief then dispatches a warrior to investigate. A wero (challenge) is given at the entrance of the marae/pa. The visitors can formally indicate whether they arrive with hostile or peaceful intent. The Master, through his agent the Junior Warden, asks the Inner Guard the cause of the alarm. The Inner Guard (armed with the sword) leaves the lodge to investigate and interrogate the initiand. The warrior affirms that the stranger is friendly and relays this information to the chief, who allows him to be admitted into the village/lodge under probationary circumstance. The visitors are then introduced into the marae grounds with songs and speeches, but are still considered to be tapu (under spiritual interdiction) and are formally constrained in their actions (until the hongi [nose pressing] completes the ceremony of welcome). The Inner Guard confirms that the initiand is not only a Mason, but is one who has been properly prepared and thus is eligible for admission. The initiand is then readmitted under the control of the Deacons (the probationary circumstance). As van Gennep notes, however, rites of threshold are not rites of union, but rites of preparation of union. The main feature of the Master Mason initiation is the enactment of the death of Hiram Abif, who was, according to Masonic tradition, the chief architect of King Solomon’s temple and the first Grand Master of Freemasonry. Much of the ritual and symbolism of the ritual is directly or indirectly concerned or associated with liminality or transition. As Turner has pointed out, ‘liminality is frequently likened to death, being in the womb, to invisibility, to darkness, to bisexuality, to the wilderness, and to the eclipse of the sun or the moon’. In the Master Mason ritual we can find almost all of these expressions of liminality. Upon the initiand’s admittance into the lodge, the room is almost pitch black, with only a very dim light glowing in the symbolic east quarter of the lodge. The initiand is then ‘introduced’ to the lodge by the public communication of the pass grip and pass word to certain officers, and receives his Obligation, a promise to remain true to the tenets of Freemasonry, the country in which he lives, and God. The initiand then receives the Exhortation which dwells on the subject of death, reminding the initiand to make use of his allotted time on Earth, and to warn him that he is about to re-enact the death of Hiram Abif. In the next phase, in most but not all lodges in New Zealand, comes a recitation of a number of passages that re-enforce the transitory (or liminal) nature of human existence: ‘[God] . . . support us under the trials and difficulties we are destined to endure while travelling through this vale of tears’; ‘Man that is born of woman is but of a few days, and is full of trouble; he cometh forth like a flower, and is cut down’; ‘man dieth and wasteth away, yea, man giveth up the ghost and where is he?’ Such passages are of a quality Frances Yates described as ‘pessimistic Gnosticism’; life is suffering, and life is a trial to be endured. While van Gennep identifies the ordeal as part of the separation process, scourging away the past, in the Gnostic schema the ordeal separates the two states of pre-birth and post-birth bliss, or, to draw on Christian symbolism, the ordeal is separation of man from God—caught between Eden and the everlasting resurrection. There follows a reading from Ecclesiastes 12:7, which again reinforces the dread inevitably of death, while the initiand is circumambulated around the lodge in a manner reminiscent of a funeral procession. Three officers who play the part of the murderers of Hiram Abif then approach the initiand. The first murderer, or ‘ruffian’, requests ‘the secrets of a Master Mason’ and is refused and strikes a blow on the initiand’s head. This process is repeated twice more, with the last blow ‘killing’ him and the body falling to the floor. ‘Low Twelve’ is then sounded—the tolling of a bell or gong twelve times, an obvious allusion to midnight, traditionally associated with the darkest part of the night, witchcraft and ‘the powers of darkness’, and that moment when it is neither yesterday nor tomorrow. In some lodges the initiand is made to lie on a floor covering, representing an open grave, while in other lodges he is lowered into a recess in the floor, or onto a cloth that is either draped over him or used to carry him around the lodge. The initiand is made to wait in darkness and silence for a period of time—in Scottish lodges the members of the lodge file out and leave the initiand alone and in the darkness for an extended period, sometimes even having dinner in that time. Van Gennep makes a connection between the womb and the grave, pointing out that they represent gateways into and out of the liminality of life. The motif of the wilderness is also to be found in the ritual. After Hiram Abif is killed, the three ruffians hide the body and flee the scene of their crime. A short time later King Solomon, perturbed by Hiram’s disappearance, sends out three search parties of Fellow Crafts, who search for their Master in the countryside surrounding Jerusalem. The wilderness has long been associated as a place of testing, from pre-biblical times and the story of Gilgamesh’s madness in the hills outside Uruk in Babylonia, to Christ’s temptation, the quest for the Holy Grail in the Perilous Forest, and even in popular culture and films such as Three Kings. Even the eclipse of the sun has an oblique place in the ritual. Masonic ritual has many explicit and implicit references to the Sun: the relationship between the Master and Wardens and the sun, for instance, as well as the sun-wise passage of officers moving in the lodge (assuming a Northern hemisphere bias). Solar attributes can likewise be tentatively associated with Hiram Abif, and thus his death can be seen as the eclipse. After the initiand has lain in the grave for a time, he is ‘resurrected’. He rises from the grave of Hiram Abif as a new and separate entity. The method of resurrection is by the ‘Five Points of Fellowship’, which comprises one of the secrets of a Master Mason and one of the modes of recognition between Freemasons. It has further significance in that the communication of the Master Masons Word can only be given in the posture of the Five Points of Fellowship. In short the resurrection of the initiand by the Five Points of Fellowship is a necessary and obligatory prerequisite to the communication of the words which (traditionally) mark a fully qualified and accepted Master Mason. The Five Points of Fellowship marks a new life within Freemasonry, the rebirth into a new status. The Five Points of Fellowship involves a physical closeness, a particular hug and handshake, between the initiand and the Worshipful Master who raises him. Such a bond is almost universally accepted as a sign of trust and acceptance by an individual and, by inference, the group that individual may represent. The raising of the initiand is followed by the communication of the secrets of the degree, the investiture of the ‘distinguishing badge of a Master Mason’—the Master Mason’s apron, and the imparting of the Extended Secrets. The significance of these parts of the ritual within the general rite of incorporation should be obvious. Each of these parts communicates to the initiand the modes and methods of identifying himself as a Master Mason, a full member of the Craft lodge. Two lectures on various aspects of the symbolism found in a Master Masons’ lodge follow, and then the Final Charge, which outlines the expected behaviour of a Master Mason. The Final Charge, while not as dramatic as earlier parts of the ritual, serves to reinforce the two-way nature of obligation and responsibility. The initiand has been received as a ‘proper object of our favour and esteem’, a fully participatory member of a Masonic lodge who must conform to ‘the ancient Landmarks of the Craft . . . [which] you are to preserve sacred and inviolate. . . [and] enforce, by precept and example, the tenets of the system’. As has been earlier pointed out, the rite of incorporation brings with it an identification of a commonality and a bond that implies a responsibility. The newly made Master Mason is told by the Worshipful Master that he is free to take his seat anywhere, a marked departure from the Entered Apprentices and Fellow Crafts who have prescribed places within the lodge where they must sit, and asked to assist in the ceremonial closing of the lodge. Again the initiand is being brought into, rather than excluded from, the corporate ritual sphere, and is no longer marked out as an individual petitioning for recognition, but rather a part of the recognised body of Master Masons. The initiand has moved from social invisibility to social visibility within the Masonic schema. In contrast to van Gennep’s structured approach to ritual, Turner is less concerned with the division of ritual into phases than he is in the examination of communitas and anti-structure, a concentration on liminality, and the mechanics of ritual. The liminal phase of ritual is particularly critical because, according to Turner, the initiates are all treated equally, deprived of all distinguishing characteristics of an external (that is ‘profane’) social structure. In following Turner’s approach it is important to keep in mind what is meant by communitas and anti-structure. Communitas has an obvious association with words such as community and, particularly, commune. Turner describes communitas as ‘a community or comity of comrades and not a structure of hierarchically arrayed positions’, implying a basic notion of equality and fraternity. Central to the idea of anti-structure is the overturning of prior social divisions, divisions instituted outside the bubble of the communitas, and the replacement with new relationships organised along a more horizontal, rather than vertical, plane. Within Freemasonry, the principle that all its members are intrinsically equal is a highly prized tenet, fostered not only by the ritual, but also by members’ attitudes to each other. Masons refer to each other as ‘brothers’, implying an essential equality among themselves (though, as in any family, some brothers are more equal than others, and senior members posses honorifics, such as ‘Worshipful Brother’, ‘Very Worshipful Brother’, ‘Right Worshipful Brother’ and ‘Most Worshipful Brother’). Much of the ritual work that accentuates equality can be found in the Entered Apprentice degree, where it is stressed that all who have become Freemasons have done so blindfolded and ‘poor and penniless’, and even monarchs ‘have exchanged the Sceptre for the Trowel’. Historically, this notion of the essential equality of brethren and the practise of a regular progression up the chain of office and into positions of authority, based not on external social status but rather on Masonic qualifications, was one of the radical qualities of the fraternity during the socially rigid 18th and 19th centuries. In the Master Mason degree the notion of communitas is built in part by the regularity and formality of the ritual itself and in part by the emotional/psychological reactions to the ritual. Outside the ritual environment itself, Freemasons informally remind each other regularly that the ritual they conduct in lodge today is (essentially) the same ritual their fathers and grandfathers used, or was used to initiate George VI, the Duke of Edinburgh, Rudyard Kipling, and any number of other prominent Masons, while even the Prichard ritual of 1730 is well within the bounds of Masonic orthodoxy. The common association with, and shared experience of, the Masonic initiation implies a commonality and equality that may not otherwise be shared. 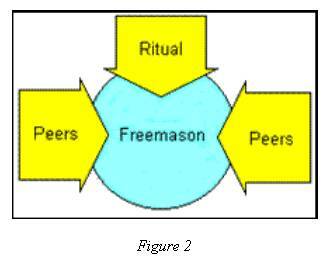 Masons are encouraged to conform to the tenets of Freemasonry by lateral pressure (from other members) and pressure from above (by the repetition of the symbols and motifs of the ritual), as shown in figure 2. Many masons are members of the Craft for the large part of their life, and lodges typically have two or three ’50-Year-Badge’ holders among their active members, who have been thoroughly indoctrinated in the Masonic idioverse and play their part in maintaining it. The general pattern of the Hiramic legend in the Master Mason’s initiation also follows Turner’s four stages of social drama. 1. Breach of ‘regular norm-governed social relations’—the Ruffians’ demands for the Word of a Master Mason. 2. Crisis—the murder of Hiram Abif. 3. Redressive actions are taken to prevent the worsening of the crisis—King Solomon sends out search parties and punishes the Ruffians. 4. Reintegration of the disturbed unit by ‘recognition and legitimation of irreparable schism’—In a Masonic context King Solomon institutes the substituted secrets of a Master Mason, the real ones having been lost with the death of Hiram Abif. The Master Mason degree has as its central motif the death of Hiram Abif and the subsequent resurrection of the initiand. Death is presented as an absolute inevitability, and the initiand is advised to fully prepare himself for the inevitable while he still has the wherewithal to do so. Death is the great leveller, respecting neither rank nor station, drawing everyone, eventually, into its embrace—‘be they king or street sweeper, sooner or later we all meet the Grim Reaper’. As Robert Anton Wilson points out repeatedly in his many books, the repetition of theme or symbol, especially one that that has prior emotive loading—such as death—affects the conscious and subconscious mind of the observer/participant. To do so in a non-threatening ritualised environment is to normalise the experience, forming a bond between all who have shared the experience. Wilson also stresses that an emotionally ‘traumatic’ (dramatic) event during the ritual process can brand the symbolism of the event directly into the psyche of the initiand, bypassing the mediation of the conscious or rational part of the brain—or, as Turner puts it, ‘in ritual one lives through events, or through the alchemy of its framings and symbolings relives semiogenetic events, the deeds and words of the prophets and saints, or if these are absent, myths and sacred epics’. The repetition of ritual over many years imparts an ineffable understanding of the nature of things, an understanding that cannot be gained through the intellectual analysis of the rituals (as D H Lawrence said ‘analysis presupposes a corpse’) but can only be communicated through its experience. Such experiences are sure to remain embedded in the mind of the initiand, but it is an experience only open to the initiand and, as van Gennep remarked, ‘only the first time counts’. The categories and concepts that embody [ritual] operate in such a way that whoever passes through the various positions of a lifetime in one day sees the sacred where before he has seen the profane, or vice versa. The complexity of the Masonic idioverse is such that it has kept men intellectually and spiritually engaged with it for almost 300 years, and lies thick over the furniture of Western culture. No matter how we attempt to look at Freemasonry, its ritual presents us with layer after layer of symbolic interactions between a multitude of different forces: religious, political, cultural, social, philosophic and historical. This paper has barely touched upon part of the Master Mason ritual (which is part of Craft Freemasonry and which, in turn, is only part of the whole Masonic edifice), using only a sample of the theories of only two anthropologists. The complexity of the Masonic schema is such that it would not be unreasonable to expect that a book would be required to simply summarise the interactions of these different forces from an anthropological perspective and, with the relaxing of Masonic attitudes towards secrecy, it would be fortunate if a fuller appraisal of the Anthropology of Freemasonry were nigh. Bell, Catherine: Ritual Theory, Ritual Practice, Oxford University Press, Oxford 1992. Bourdieu, Pierre: Outline of a Theory of Practise, trans Richard Nice, Cambridge University Press, Cambridge 1977. Carlyle, Richard: A Manual of Freemasonry, Reeves & Turner, London c 1842. Carr, Harry: The Early French Exposures, QCCC Ltd, London 1971. Durkheim, Emile: The Elementary Forms of Religious Life, trans Joseph Ward Swain, Free Press, London 1915. Eliade, Mircea: Birth and Rebirth: The Religious Meanings of Initiation in Human Culture, Harper & Row, New York 1958. ——— From Primitives to Zen: A Thematic Sourcebook of the History of Religions, Wm Collins & Sons, London 1967. ——— A History of Religious Ideas: from the Stone Age to the Eleusian Mysteries, University of Chicago Press, Chicago 1978. Frazer, J G: The Golden Bough, Papermac, London 1978. Geertz, Clifford: The Interpretation of Cultures, Basic Books, New York 1973. Grand Lodge of New Zealand: The Ritual of the Three Degrees, Wright & Carman, Wellington 1989. ——— The Book Of Constitution for the Grand Lodge of Ancient, Free and Accepted Masons of New Zealand, Grand Lodge of New Zealand, Wellington 1994. Grainger, Roger: The Language of the Rite, Darton, Longman & Todd, London 1974. Grimes, Ronald L: Readings in Ritual Studies, Prentice-Hall, Englewood Cliffs 1996. Hamill, John: The Craft: A History of English Freemasonry, Crucible, London 1986. Hamill, J & Gilbert, R: Freemasonry: A Celebration of the Craft, Greenwich Editions, London 1993. Hayward, H L: ‘Freemasonry and the Ancient Mysteries’ in The Builder, 1923. Jones, Bernard E: Freemasons’ Guide and Compendium, George G Harrap, London 1957. Knoop, Douglas and Jones, G P: The Scottish Mason and the Mason Word, Manchester University Press, Manchester 1939. ——— The Genesis of Freemasonry, Manchester University Press, Manchester 1949. Knoop, Douglas, Jones G P & Hamer, Douglas: Early Masonic Pamphlets, Manchester University Press, Manchester 1945. ——— The Early Masonic Catechisms, QCCC Ltd, London 1978. La Fontaine, J S: Initiation, Penguin Books, Harmondsworth 1985. Leadbeater, C W: The Hidden Life in Freemasonry, Theosophical Publishing House, Adyar 1955. Luhrmann, T M: Persuasions of the Witch's Craft: Ritual Magic in Contemporary England, Harvard University Press, Cambridge, MA 1989. MacNulty, W Kirk: Freemasonry: A Journey through Ritual and Symbol, Thames & Hudson, London 1997. Nilsson, M P: ‘Mysteries’ in Oxford Classical Dictionary (4 edn, N G L Hammond and H H Scullard eds, Clarendon Press, Oxford 1970. Prichard, Samuel: Masonry Dissected, Poemandres Press, Boston 1996 . Roberts, J M: The Mythology of the Secret Societies, Paladin, St Albans 1974. Street, Oliver Day: Symbolism of the Three Degrees, Masonic Service Association of the United States, Washington DC 1924. Turner, Victor: The Forest of Symbols: Aspects of Ndembu Ritual, Cornell University Press, Ithaca 1967. ——— The Drums of Affliction: A Study of Religious Processes Among the Ndembu of Zambia, Clarendon Press, Oxford 1968. ——— The Ritual Process, Routledge & Kegan Paul, London 1969. ——— ‘Symbols in African Ritual’ in J L Dolgin, D S Kemnitzer & D M Schneider eds, Symbolic Anthropology: A Reader in the Study of Symbols and Meanings, Columbia University Press, New York 1977. ——— ‘Dramatic Ritual/Ritual Drama: Performance and Reflexive Anthropology’ in Jay Ruby ed, A Crack in the Mirror, University of Philadelphia Press, Philadelphia 1982. ——— On the Edge of the Bush: Anthropology as Experience, E L B Turner ed, University of Arizona Press, Tucson 1985. ——— The Anthropology of Performance, Johns Hopkins University Press, Baltimore 1987. Turner, V & Turner, E: ‘From Ritual to Theatre: The Human Seriousness of Play’ in Performing Arts Journal, 1982.
van Gennep, Arnold: Rites of Passage, University of Chicago Press, Chicago 1960. Wilson, Robert Anton: Quantum Psychology: How Brain Software Programmes You and Your World, New Falcon Publications, Tempe 1993. ——— Prometheus Rising, New Falcon Publications, Tempe 1993. ——— New Inquisition, New Falcon Publications, Tempe 1994. Wiseman, Boris & Groves, Judy: Levi-Strauss for Beginners, Icon Books, Duxford 1997. Yarker, John: The Arcane Schools, Rider & Sons, London 1909. Yates, Frances A: Giordano Bruno and the Hermetic Tradition, Routledge & Kegan Paul, London 1964. Bill and Ted’s Excellent Adventure, 1989 (USA). Director Stephen Herek, with Keanu Reeves, Alex Winter. Three Kings, 1999 (USA). Director David Russell, with George Clooney, Mark Wahlberg, Ice Cube, Spike Jonze. Hart, Alan: 1985: Personal communication. Grand Lodge of New Zealand’s definition of Masonic secrecy. Young, Sandy: 2000: Personal communication. Scottish working of the Master Mason degree. NB: This paper will not be read out at the conference, but rather discussed, clarified and explained. Hiram can quite clearly represent the sun. Masonic symbolism constantly refers to the sun. For example, all three primary officers of the lodge are associated with the sun during parts of the day and there is no officer in the north representing night—the sun has set. We also see the same phenomenon in the cycle of the seasons: a waxing sun beginning at the Spring Equinox in the east, a sun at its zenith in the Summer Solstice to the South, a waning sun at the Fall Equinox in the West, and the dark months of winter to the North. These are essentially the paths that Hiram trod in his travails before his murder, going to the three temple gates. While we all know that the rituals of our Grand Lodge, in sympathy with the Volume of the Sacred Law, contradict this, stating that the blows were struck in the north, south and east, one of the earliest Masonic rituals that we have—the first to give us the Master Mason degree, Prichard’s Masonry Dissected—tells us that the three blows which struck down Hiram Abif were struck in the East, South and West gates of King Solomon’s Temple, which mimics the path of the Sun through the equinoxes. A number of mystery religions had this solar allegory as the basis of their rituals, in which the candidate for the mysteries assumed the part of the solar deity, was slain and then raised. Like the sun, the candidate experienced a rebirth. Walter Burket says, in Ancient Mystery Cults, ‘The basic idea of an initiation ritual is generally taken to be that of death and rebirth’, while Arnold van Gennep, the great anthropological theorist on the study of ritual in religion, identifies the climax of most initiations to be the separation of the candidate between as he was before the initiation and as he will be after the initiation. Van Gennep explicitly identifies initiation with the death and rebirth of the candidate. The great drawback of entering a field that has been largely dominated by professional academics is that the literature has been written largely for other professional academics. The field of Rituals Studies within Anthropology is, alas, no exception. As a university student, one is fortunate in that lecturers and tutors (usually) make a good attempt at reducing the sometimes obtuse and abstract theories into plain English, which, coupled with the incentive of ever looming essays or exams, provides both the resources and the motive that may be lacking in a more recreational reader, to grapple with and understand the ideas. Two small and unintimidating works are Arnold van Gennep, Rites of Passage, and J S La Fontaine, Initiation. Both authors are well respected and give a general introduction to some of the ideas that are (or were) in currency and, more specifically, give examples of how ritual can be interpreted and analysed. However, both van Gennep and (to a more limited extent) La Fontaine have dated somewhat, and a useful anthology to read to gain a wider and more modern appreciation of ritual theory is Readings in Ritual Studies, edited by Ronald L Grimes. Another book at the lighter end of the spectrum is The Language of the Rite, by Roger Grainger. Written for a non-academic readership, The Language of the Rite is a defence of the Anglican ritual, and Grainger (an Anglican) calls on a number of well known theorists and writers in support of his cause, Claude Levi-Strauss and Mircea Eliade in particular. In places it is a little confused and I rather suspect he does not fully understand the theoretical source-material, but nonetheless it is an accessible introduction to the subject, especially of the ‘big picture’ (if you don’t mind correcting the occasional minor misunderstanding at a later date). A quick glance through my bibliography will reveal that I have leaned heavily on Victor Turner and would particulary suggest his Ritual Process, and also Forest of Symbols, Ritual Theater, Anthropology of Experience, and his essay ‘Dramatic Ritual/Ritual Drama: Performance and Reflexive Anthropology’ in Jay Ruby’s A Crack in the Mirror, as a sound base to serious engagement with anthropological theory. Much of his later works deal with the relationship between theatre and ritual and is also profitable reading. One of the joys of reading Turner is that he turns a good phrase. As a curious aside, in his later life he adopted Catholicism, possibly the most ritualistic of the accessible Christian denominations. For the advanced reader there are two authors which stand out, Catherine Bell (whose Ritual Theory, Ritual Practise is just heavy going) and Claude Levi-Strauss, to whom I have not referred in this paper, but who is generally known as the father of Structural Anthropology. A prolific author, Levi-Strauss’ ‘The Structural Study of Myth’ in the Journal of American Folklore (1955), is one of the seminal works on the deconstruction of myths, using the Oedipus story as an exemplar. While not directly dealing with ritual, the methodology is interesting and has potential to further understanding of both the ritual and narrative elements of Freemasonry. The article can be found online at <http://transcriptions.english.ucsb.edu/archive/courses/liu/materials/Levi-Strauss/oedipus.html>. However, reading Levi-Strauss for Beginners, by Boris Wiseman and Judy Groves may well be a good idea before tackling the master. For general reading in the area of psychology, mythology and religion in support of a better understanding of ritual, possibly the best place to start is Robert Anton Wilson—a very interesting chap, and contempory and friend of Timothy Leary. He writes in what I find to be a very entertaining and provoking style, and is not to be attempted by readers without a sense of humour. He has justly been called the philosopher of the Psychedalic Generation, but thirty-five years later he is still going strong. Start with Prometheus Rising and New Inquisition, and if you like them (and you may think they are a load of rot), try his other books. Another author that has his critics is Mircea Eliade, but, after having around 1600 published works, he is bound to upset someone. Eliade’s writings on mythology and religion are worth reading and debating, particularly Birth and Rebirth: The Religious Meanings of Initiation in Human Culture. And finally, one cannot discuss the serious study of myth without mentioning Joseph Campbell. The Masks of God and The Hero With a Thousand Faces are possibly his most well known works. Campbell’s approach is largely to deconstruct myths and look at their psychological and cultural significance, and pursue the quest for the great archetypes of human consciousness. Alas, he is another author who often writes with an academic audience in mind, and some of his books are somewhat solid (the term ‘small windowless buildings’ springs to mind), but should you ever be able to see the series of video interviews with Bill Moyes, do so—he is an engaging speaker. As a student of anthropology with a particular interest in Ritual, I am continually amazed at how closely formal theory matches the construction of Masonic ritual. It is often closer than the examples culled from the cultures and experiences which gave rise to the theories in the first place—a closeness unbeknown to the theorists themselves. If more Masonic researchers took the time (and effort) to seek to understand the theories of people like van Gennep, Turner and Levi-Strauss, a whole new area of Masonic investigation would be opened up, not just in the appreciation of Masonic ritual, but the whole fabric of Freemasonry. Wilson, in Victor Turner: The Ritual Process, Routledge & Kegan Paul, London 1969, p6. Words being, of course, just another kind of symbol system. First published in French in 1906 as Les rites de passage; however it was not translated into English until 1960. Arnold van Gennep: Rites of Passage, University of Chicago Press, Chicago 1960, p3. It was not until the 1970s, when the supply of ‘pre-industrial’ societies was starting to dry up, that ethnographic studies on elements of modern societies started to become popular. ‘. . . the whole subject of secret societies was neglected as an area for serious investigation . . . Because the historian has passed by, the charlatan, the axe-grinder and the paranoiac long had the field to themselves. . .’ J M Roberts: The Mythology of the Secret Societies, Paladin, St Albans 1974, p25. Douglas Knoop, G P Jones, D Hamer and Harry Carr immediately spring to mind. Oliver Day Street: Symbolism of the Three Degrees, Masonic Service Association of the United States, Washington DC 1924, p117. C W Leadbeater: The Hidden Life in Freemasonry, Theosophical Publishing House, Adyar 1955, px. John Gilbert: ‘William Wynn Westcott and the Esoteric School of Masonic Research’ in (1987) Ars Quatuor Coronatorum 100:6. J S La Fontaine: Initiation, Penguin Books, Harmondsworth 1985, pp49–51. The account was taken from Charles William Heckethorn’s The Secret Societies of All Ages and Countries (1875); 1965 edn quoted. I remember having seen the ritual for this unusual form of initiation some years ago but, alas, I cannot remember any details of where and when it can now be found. Alan Hart, Grand Secretary, personal communication, 1985. Mircea Eliade: From Primitives to Zen: A Thematic Sourcebook of the History of Religions, Wm Collins & Sons, London 1967, p300. Mircea Eliade: A History of Religious Ideas: from the Stone Age to the Eleusian Mysteries, University of Chicago Press, Chicago 1978, pp290–301. W Kirk MacNulty: Freemasonry: A Journey through Ritual and Symbol, Thames & Hudson, London 1997, pp11-15. Catherine Bell: Ritual Theory, Ritual Practice, Oxford University Press, Oxford 1992, p3. T M Luhrmann: Persuasions of the Witch's Craft: Ritual Magic in Contemporary England, Harvard University Press, Cambridge MA 1989, p347. J G Frazer: The Golden Bough, Papermac, London 1978, pp444,541,797,905, passim. Emile Durkheim: The Elementary Forms of Religious Life, trans Joseph Ward Swain, Free Press, London 1915, pp40–41. Victor Turner: ‘Symbols in African Ritual’ in J L Dolgin, D S Kemnitzer & D M Schneider eds, Symbolic Anthropology: A Reader in the Study of Symbols and Meanings, Columbia University Press, New York 1977, p183; ‘Dramatic Ritual/Ritual Drama: Performance and Reflexive Anthropology’ in Jay Ruby ed, A Crack in the Mirror, University of Philadelphia Press, Philadelphia 1982, p75. Victor Turner: The Drums of Affliction: A Study of Religious Processes Among the Ndembu of Zambia, Clarendon Press, Oxford 1968, p2. Victor Turner: The Ritual Process, Routledge & Kegan Paul, London 1969, p94. Turner: ‘Dramatic Ritual/Ritual Drama: Performance and Reflexive Anthropology’, p25. Turner: The Forest of Symbols: Aspects of Ndembu Ritual, Cornell University Press, Ithaca 1967, pp99–108; On the Edge of the Bush: Anthropology as Experience, E L B Turner ed, University of Arizona Press, Tucson 1985, pp291–301; V Turner & E Turner, ‘From Ritual to Theatre: The Human Seriousness of Play’ in Performing Arts Journal, 1982, pp203–206. Turner: The Ritual Process, pp.96–97. Turner: ‘Dramatic Ritual/Ritual Drama: Performance and Reflexive Anthropology’, pp85-86. Turner: Turner: ‘Dramatic Ritual/Ritual Drama: Performance and Reflexive Anthropology’, p80. Or, as Schwartz more pedantically puts it, the idioverse is the ‘individual cognitive, evaluative and affective mapping of the structure of events and the classes of event’. Turner: The Ritual Process, pp117,128–129. Clifford Geertz, The Interpretation of Cultures, Basic Books, New York 1973, p112. Turner, The Ritual Process, p95. Frances A Yates: Giordano Bruno and the Hermetic Tradition, Routledge & Kegan Paul, London 1964. Sandy Young, 2000, Personal Communication. Turner: The Forest of Symbols, pp93–111. Turner: The Forest of Symbols, p100. Turner uses ‘anti-structure’ ‘. . . to describe both liminality and what I have called “communitas”. I meant by it not a structural reversal . . . but the liberation of human capacities of cognition, affect, volition, creativity, etc., from the normative constraints incumbent upon occupying a sequence of social statuses’. (From Ritual to Theater: The Human Seriousness of Play, p44). Turner: ‘Dramatic Ritual/Ritual Drama: Performance and Reflexive Anthropology’, pp86–87; The Anthropology of Performance, p34. A History of Religious Ideas: from the Stone Age to the Eleusian Mysteries, University of Chicago Press, Chicago 1978, p301.